Zoe Weil has been a fixture in the animal rights movement for more than 20 years. 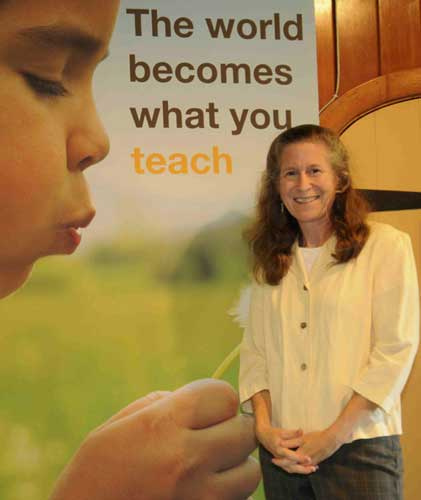 The president of the Institute for Humane Education (IHE), Zoe has taught tens of thousands of young people about living with respect and compassion for others, and she has trained thousands of adults to be humane educators. IHE offers the first Master of Education program in Humane Education as well as a Humane Education Certificate Program and weekend training workshops across the U.S. and Canada. Zoe has served as a consultant on humane education to people and organizations around the world, and she also serves on the advisory board of the Food Empowerment Project, which seeks to create a more just and sustainable world by recognizing the power of one’s food choices. In July, Zoe was inducted into the U.S. Animal Rights Hall of Fame. That same month, I saw her give an inspiring presentation at Taking Action for Animals (TAFA) in Washington, DC, where she focused on what she calls the three I’s: inquiry, introspection and integrity. She emphasized the importance of inquiring about our choices (what we eat, wear, etc. ), and then being introspective about how those choices impact others, the planet and ourselves. Finally, we should live with integrity: if our choices have a negative impact, remember that there are always other, less negative choices we can make. Her many books include Most Good, Least Harm and Above All, Be Kind. Zoe kindly took some time from her busy schedule to field some questions about her activism and philosophy. First of all, Zoe, congratulations on being inducted into the U.S. Animal Rights Hall of Fame this year. You’re up there with Paul Watson, Ingrid Newkirk, Henry Spira, Karen Davis, Bruce Friedrich and Cleveland Amory, to name just a few. Which activists have inspired you and your work? All of the people who just mentioned have been an inspiration to me! Each of them has done so much for animals, and I’m in awe of their efforts and achievements. Perhaps the activist who has had the biggest impact on me, and who was also inducted into the AR Hall of Fame a couple of years ago, is Paul Shapiro. Every day, Paul faces the worst atrocities perpetrated on animals because he works on factory farming issues, yet he remains non-judgmental, funny and kind to everyone — even those “opponents” who hurl expletives at him. I’ve seen him turn those “opponents” into allies with his warmth, clarity, reasoning and non-defensive attitude. That combination of tenacity, commitment and unrelenting effort with humor, positivity and compassion toward everyone is what will create a humane world. He’s taught me so much. Yes, at TAFA, you read an email exchange Paul had with an angry meat-eater. It was amazing how he completely disarmed the guy by being compassionate, rather than defensive. You began your presentation there by saying we are all educators. What can animal activists do to become better educators? We need to remember that no one wants to learn or consider changing because they’re being browbeaten or judged or yelled at. Most people do want to learn and grow, and almost everyone wants to be happier, healthier, more at peace, more aligned with their values and part of a group of joyful people. Yet, many animal activists are so angry — rightfully so, mind you — and this rage is off-putting and counterproductive. We need to find ways to deal with our sorrow, despair and fury about what’s being done to animals, but we need to do so with our friends and colleagues, not as activists trying to create change in the world. Good educators enthusiastically invite people to learn new things and act on what they learn in positive ways; they don’t tell others what to do or shame them. You say that as activists we need to deal with our anger, sorrow, etc., with friends and colleagues. How do you deal with it? Joan Baez once said, “Action is the antidote to despair,” and Mahatma Gandhi once responded to a reporter asking, “What is your message?” by saying, “My life is my message.” These two quotes are my mantras. I have been lucky to find the perfect action to deal with my despair and anger: I became a humane educator. Humane education is so heartening and positive and effective that it constantly helps dissipate anger, feed hope and foster good communication. I’m one of those people who can be very reactive and angry. Being a humane educator requires that I practice being kind and respectful all the time. I’m not always successful, but I’m always making an effort. Remembering that my life is my message helps me to model what I hope to create. I do vent with my husband, friends and colleagues, and this helps tremendously to blow off steam, but venting is a relief valve, not a strategy for creating change. It’s critical to find healthy ways to make a difference that promote kindness and joy in ourselves and others. Another point you stressed in your presentation at TAFA is that it’s important that kids not simply believe what you tell them. Can you explain? I believe that education — specifically humane education, which draws the links between human rights, animal protection and environmental preservation, and provides the tools for people to become more conscientious choicemakers and engaged changemakers for a better world — is the most effective strategy for solving all our problems and creating a humane, peaceable and sustainable society. Humane education goes to the root of all our challenges and problems and invites learners to become what we call solutionaries. But education is not indoctrination. My biggest goal as a teacher is for my students to be creative and critical thinkers. Only with these skills will they be able to solve our problems effectively and wisely. We humans believe so much that is unsubstantiated and false, and if students just believe me, then I have not done my job, because even though I endeavor to always speak the truth and share what, through my research, I believe to be accurate, my students have no way of knowing whether the information I share is true unless they are prepared to follow up and learn for themselves. If I give them anything at all, it should be the capacity to discern fact from opinion and to be lifelong learners who seek the truth so that they are able to live with integrity. What’s the philosophy behind “most good, least harm”? For years when I did assembly programs in schools, I’d bring in a canvas bag filled with things that represented choices, like a Styrofoam cup and a ceramic mug, or a shampoo tested on animals and a cruelty-free shampoo. I’d ask the students which of the two choices did the most good and the least harm to themselves, other people, animals and the environment. Over time I realized that this had become the guiding principle for my life. I’m always asking myself how I can do the most good and the least harm through my various choices, from what I eat, wear and buy, to what I do for work, to how I engage in democracy and activism and so on. I call this the MOGO — most good — principle. I ended up writing a book called Most Good, Least Harm because, while this is a simple principle in theory, it’s really challenging in practice and I wanted to give people the tools and tips I had discovered. At the Institute for Humane Education we have a month-long, distance-learning course called A Better World, A Meaningful Life, which is coming up in September. It’s an opportunity for people to explore how to use this principle, deeply examine their values, passions, goals and talents and create a life that is both meaningful and makes a difference in the world. You’ve been a role model and educator for both children and adults. Which group is more receptive to your message? Kids are way more receptive! Before co-founding the Institute for Humane Education and focusing on training adults to be humane educators, I focused my humane education efforts at the middle school through college levels. This was because youth were always eager to learn what I had to teach. They never said to me, “Oh, Zoe, please don’t tell me about x, y or z. I don’t want to know.” Adults, however, are constantly saying such things. Youth are in the process of defining themselves and developing their values. They don’t like to be hypocrites, and they don’t have decades of entrenched habits to break. Adults, on the other hand, have often built up all sorts of rationalizations and defenses along with their habits. With that said, I now spend my time teaching adults, but these are self-selected adults who want to learn how to be humane educators and want to explore how to live in ways that are more deeply aligned with their values. With that said, everyone has to find the group that they relate to best. For some, it’s young children; for others, it’s the elderly; for others, it’s parents. The one group that I would say is challenging for most people is their own families of origin. You bring up a good point: a lot of activists tell me that they can reach out to total strangers, but family members and friends are the biggest challenge. Do you have any advice for those who want to nudge the people closest to them toward more ethical living? My advice is to let go of trying to influence or change family and close friends. It’s amazing how often, when we are truly able to let go of our attachment to our loved ones’ choices, they are most likely to be receptive to what we have to share. We need to realize that if we’ve learned something and changed, that change may have negative effects on our loved ones. Our new choices may be inconvenient, threatening and cause defensiveness. This isn’t true with strangers or students in a classroom. In those cases, there’s no “charge” around learning from you. One of the ways in which we at the Institute for Humane Education try to help activists and humane educators is to give them tools for non-judgmental and positive communication, but most people will say that it’s still hardest with family and close friends. For more about Zoe’s work, check out ZoeWeil.com.